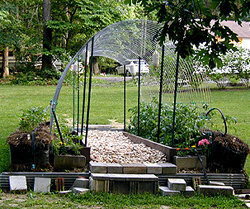 I experimented with an arched trellis made with concrete re-mesh wire and metal fence posts for my tomatoes and pole beans last year. It was a great success despite the late tomato blight, so this year I wanted a more structurally sound arched trellis and the cattle panels were the perfect size, sturdy and easy to manage! I like to use the straw bale gardening method with a strong trellis for my tomatoes. I like Kentucky Wonder green beans which require a taller trellis than I care to climb. 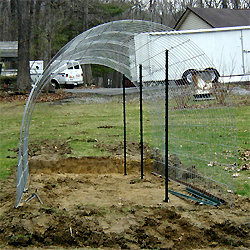 I saw a make-shift arched trellis made from concrete re-mesh and immediately thought that could work for me! 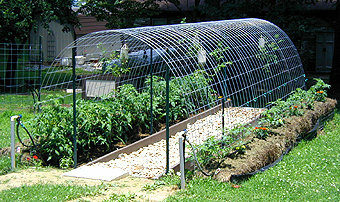 I could grow my two favorite vegetables on either side of an arch of wire that would be assessable to me from the ground. I also remembered how much fun the kids had under the "pickle teepee" we had made for them out of sticks, strings, and cucumber seeds years ago. The kids could easily pick the cukes as they hung down on the inside of the little structure. I was hoping for a similar experience with my tomatoes and beans. 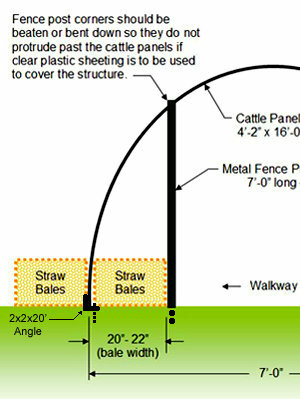 The dimensions of the sections of re-mesh we used were very close to the dimensions of cattle panels, rigid fencing-type sections, sold at farm supply and feed stores. We have seen the single panels used as arched trellises in the past, so this year we decided we could make a neater, stronger, and longer lasting arched trellis and hoop house using the panels. The following is a short slideshow video of last year's tomato and bean arched trellis. There may be a hundred different ways of erecting a structure of this kind, but this is the method we chose, and the materials we used, primarily because of what was available to us, skills we possess, and the limitations of the site. Every site and situation will be different. The basics of the structure are that the cattle panels are rigid, strong, but flex just enough to lend themselves to be used in this fashion. NOTE: There are various types (grades) of fencing panel units, and different styles along with a wide price range. You will have to judge for yourself which will suit your needs and budget. The hillside was dug out about two feet deep at the high end to help level up the site. 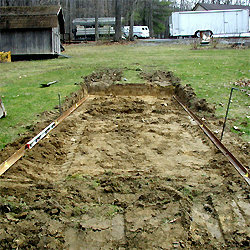 The angle iron rails were installed on either side of the dug out area and made level, parallel with each other, and square. This meant digging out a little more in some places, or shimming with bricks in others. The angle pieces were anchored in place with the "L"-shaped rebar driven through holes burned through the angle sides. 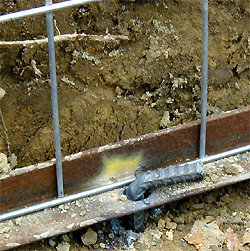 In this close up of one of the anchors, you can see how the rebar was placed through the holes and into the ground. 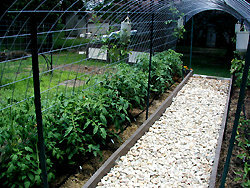 We used big plastic tent stakes driven into the ground to hold the concrete re-mesh in place for last year’s trellis. They may also work for the cattle panels! 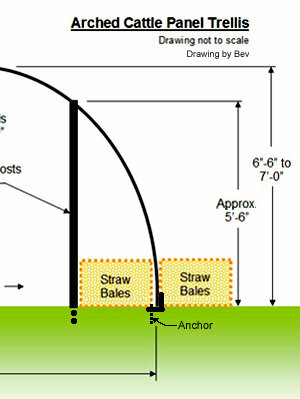 The anchors help hold the angle in place when the cattle panel ends are flexed into position between the two pieces of angle. Wire ties were used to connect and hold the sides of the cattle panels together, which also helped to tighten the structure. Metal fence posts were used as supports for the additional weight of the mature vines of fruit. 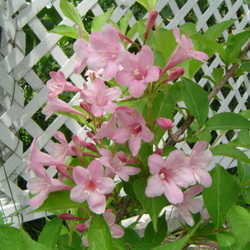 It also helped to stiffen the trellis hoop. A view from inside the trellis. 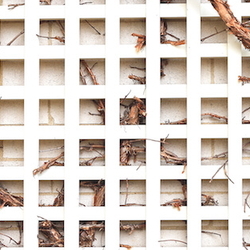 A view of the rear corner of trellis. Here is the cattle panel arched trellis about the middle of June, 2010, with plants growing on the inside in beds, and on the outside in hay bales. We are still working on block steps, retaining walls, and a small patio in front. We dumped a ton of river rock for a path in the middle of the inside and installed a watering system for the soaker hoses. 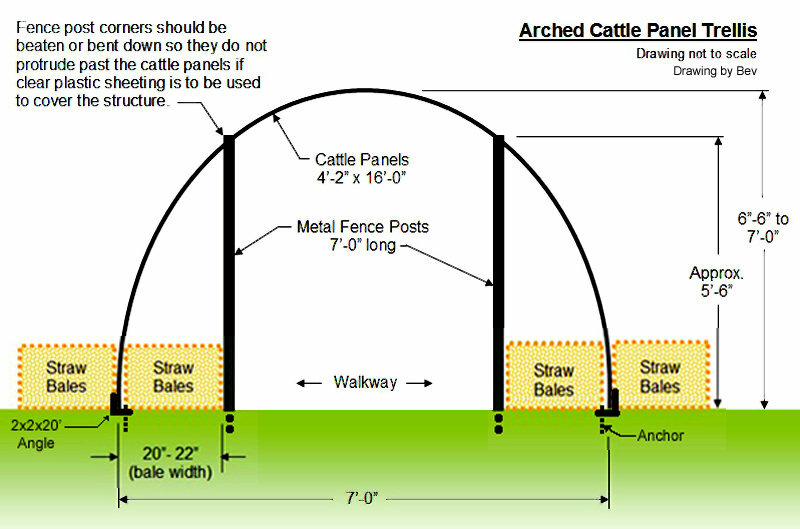 I hope our experience with the arched cattle panel trellis has shown you another option for supporting those very tall garden plants and still be able to harvest the vegetables without a ladder. Have a great garden season! 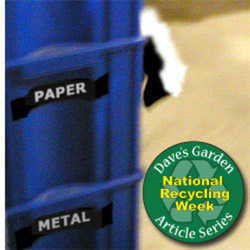 I was a serious organic gardener and composter 30 years ago, then my life took me in a new direction with kids and career. I am just now returning to gardening and learning new techniques, and loving every minute of it. I hope to share my experiences with you from my shady yard.